After a chastening 32-20 loss to England last weekend, nothing less than a victory will suffice for Ireland if they are to retain any hope of winning back-to-back Six Nations titles. Joe Schmidt knows that defeat would not only spell the end of their championship but also have repercussions for their World Cup ambitions, severely denting the confidence that had been built up from last year's achievements. A loss in Murrayfield, which is braced for very windy conditions on the back of Storm Erik, would mean that Ireland would have to get themselves up for their three remaining games knowing that there's no silverware up for grabs. Their next game of consequence would be against Scotland in Japan. "Will there be much credence given to what happens tomorrow in [September]? Possibly, but we need to focus on winning a Six Nations game." To do that they must hand Gregor Townsend's men their first home defeat in the competition since 2016. And that must be accomplished without a number of regulars. There are five changes to the team that underperformed against England, with Rob Kearney, Chris Farrell, Quinn Roux and Jack Conan replacing the injured Robbie Henshaw, Garry Ringrose, Devin Toner and CJ Stander, while Sean O'Brien switches places with Josh van der Flier, who is on the bench. Schmidt has gone out of his way to mention building "flexibility" ahead the World Cup in interviews over the last two weeks but changing a third of the team is far from ideal. Scotland make four changes to the team that beat Italy 33-20 with hat-trick man Blair Kinghorn benched for Sean Maitland on the wing. As Craig Gilroy knows, scoring three against the Azzurri carries little weight. With prop WP Nel and back row Sam Skinner injured, in come Simon Berghan and Josh Strauss, while lock Jonny Gray returns to displace Ben Toolis. "Most of those players played against Ireland last year and in 2017, so they know what Ireland are capable of and what a good team they are," said Townsend. "But they also know what we did well in those two games, so to have that level of quality and conversation as you lead into a game is important as it the experience they have when they get on the field." All told that is 114 caps worth of experience coming in, while Ireland's tally is 163 with 140 of those belonging to Kearney and O'Brien, who didn't train in yesterday's captain's run; being "managed" in IRFU speak. As pointed out by former Ireland international Bernard Jackman on the RTE Rugby podcast, Ireland are not a team that dominate other sides. Last year's championship was won because Ireland came good in tight games, albeit the final-day win over England was comprehensive. "Sometimes the danger is that you can forget what has worked really well for you," said Best yesterday - despite the manner of the England reversal, the baby won't be thrown out with the bath water. "The Sunday night / Monday morning meeting was tough," he said. "We asked the question, what did we feel was different. We expect to play with more intensity, we expect to play with more accuracy." Home advantage has usually proven pivotal in this fixture in recent seasons. 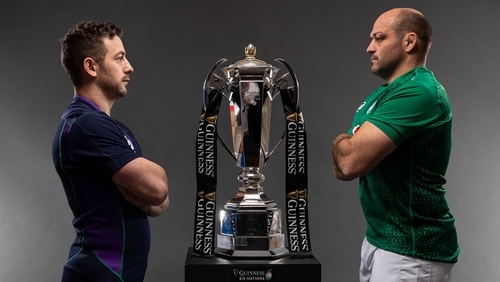 Of the last seven encounters between the sides, Ireland's 40-10 demolition of Scotland on the final weekend of the 2015 Six Nations marks the only time the away side departed with a win. One can imagine that the replay of the 27-22 loss here two years ago got a review this week and it's makes for a timely reminder of how to fall flat. Scotland took advantage of Ireland's narrow defence and caught them napping at a lineout. That shouldn't happen again. Scotland ran in five tries in last week's 33-20 win over Italy and the late concession of three tries can be discounted as a major fault. The game was over at that stage. "Ireland know that if they do lose this weekend it's unlikely they are going to win the Championship," added the Scotland boss. "They will be driven to bounce back straight away after losing to England but we are expecting an excellent Ireland performance going into this game whether they won or lost last weekend and I'm sure that's what they're going to bring." Ireland have simply no option but to produce a reaction to last week's mess. It doesn't have to be pretty but it has to be intense.